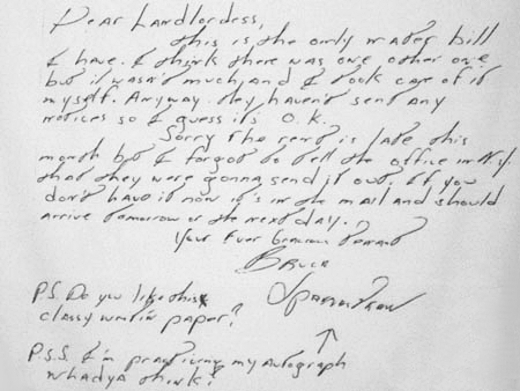 Before The Boss was the Boss he was renting a place and paying his rent and water bills late...aren't we all Bruce, aren't we all. 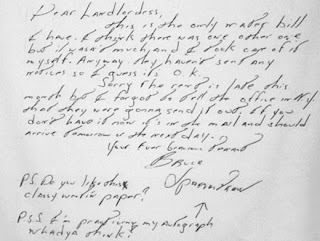 This letter was written to his landlord in 1975 months before Born to Run made him a rock star...something about water bills - but I love the PPS "I'm practicing my autograph, whadya think?" Well thank God he was practicing that...the most important part of his job right. Ha ha. This is the only water bill I have. I think there was one other one but it wasn't much and I took care of it myself. Anyway they haven't sent any notices so I guess it's O.K. Sorry if the rent is late this month but I forgot to tell the office in N.Y. that they were gonna send it out. If you don't have it now it's in the mail and should arrive tomorrow or the next day. P.S. Do you like this classy writin' paper? P.S.S. I'm practicing my autograph. Whadya think?